Highlight for the year would have to be Cuboree in January. 5 nights of camping away from home with 2000 other cubs. Then a wide variety of activities including Canoeing, Bayview Canoe night, Sailing, Flip Out, and many others listed below. 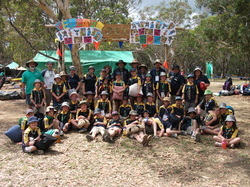 The NSW Cuboree was held from the 6th to 10th January 2014 at Cataract Scout Park. There was over 2000 8, 9 and 10 year old Cubs attending a five day camp just for them. NSW Cuboree is only held once every three years, so most Cubs only get one chance to go! To get an idea of some of the activities and highlights, check out the photos of our pack at the Cuboree. We joined up with Balgowlah and Cromer Dee Why. Each cub in our cuboree pack got a DVD with over 1000 photos on it. See photos from the November Shakedown Camp at Ingleside. A great day of fun and activities with hundreds of cubs from Sydney North Regions. See the story and photos. Awesome moonlit walk where it only rained right at the end of the night. Cub packs from across Sydney North Region enjoyed a weekend of fun in the snow - throwing snowballs, riding a toboggan and making snowmen. See the photos. We're going to the 1st Collaroy Plateau Cubs Halloween Disco on Friday 31 October. Come along in fancy dress for a night of dancing, games and fun. Download the poster and colour in the witch to go in the running to win a great prize! This is a fun district event where we will meet up with other packs to tour the Scout Heritage Centre, take a steam train ride and check out the $8 million playground at Sydney Olympic Park. We'll travel by public transport, ferries and buses. Cost for the day is $15 plus you need to provide a $2.50 Family Fun day bus/ferry ticket.